In a non-stick frying pan, toast 25g pumpkin seeds for 1-2 minutes until golden, reserve and set aside. In a separate pan heat 1 tsp olive oil and gently cook 300g cherry tomatoes, halved, with ½-1 tsp Waitrose Cooks' Ingredients Chilli Sauce for 3-4 minutes, until soft. Return the first frying pan to the heat and add 2 tsp olive oil before frying 2 x 150-175g pack Waitrose Cod Fillets for 3-4 minutes on each side until just cooked. Stir the toasted pumpkin seeds into the tomatoes. 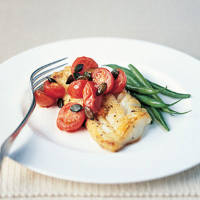 Spoon the sauce over the cod, and serve with green beans.